Angklung is Traditional musical instrument originally from Sundanese tribe - Indonesia. According to Dr. Groneman, angklung had already been a favorite musical instrument of the entire archipelago even before the Hindu era. 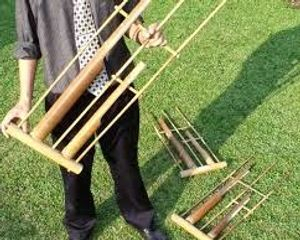 According to Jaap Kunst in Music in Java, besides West Java, angklung also exists in South Sumatra and Kalimantan. Lampung, East Java and Central Java are also familiar with the instrument (wikipedia). In ancient time, angklung used in ceremonial, one of ceremonial is Mapag Sri, a ceremony of paddy harvest and later time angklung used in ceremony party boy circumcision. Now angklung everyone can play as announced by UNESCO as intangible world heritage ini 2010. I am a native player for this instrument and everyone can learn and play angklung with me; there are toddlers, teenagers, adult, school students, teachers, headmasters, lecturers, government officials have joined in my local and international class. 1. Barli Art Center (Bale Seni Barli) Bandung - West Java, Indonesia. 2. 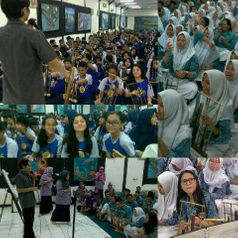 Contact me to teach or play Interactive angklung at your school, office, event or privately and special occasion.